Flexible tools that can help new teams from different services work together effectively. If you are working in a multi-​service team, with new members or in a new building, these tools could help you work together more effectively and improve communication around issues, such as resource planning and engaging with customers. 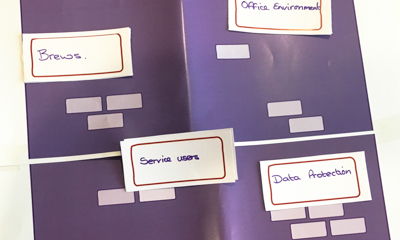 Each tool was co-​designed and tested by professionals working in various services for Lancashire County Council around addressing specific challenges that come from the transition into new multi-​service teams and buildings. 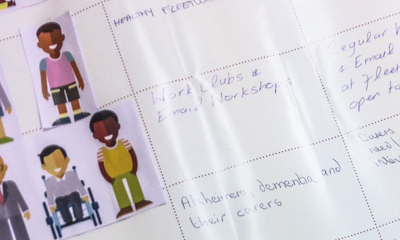 Each tool was created by professionals in the Lancashire’s library service, responding to the challenge of bringing multiple services together in the same place. Help teams from different backgrounds come together and share knowledge and space. Help get the word out about new services and offerings; map out what is on offer, and how to let communities know. 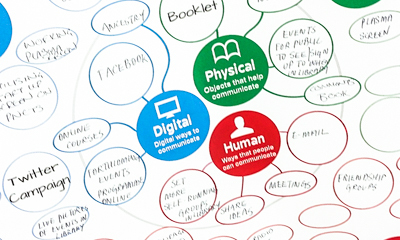 Seven tools, available to download from this website, print and put straight into action. Leapfrog tools are free to anyone. We Creative Commons licensing for everything we do. The team of six at Poulton Library have been completing daily challenges on the Comms Stretcher tool, such as “positive publicity for the library”, which were described as “quick wins” for the team. So far, the best idea has been for libraries countywide to go for a Guinness World Record for most books borrowed on National Library Day. Staff on the borrowing desk used the Flow Customer Cards to think about and discuss short staffing issues affecting their Baby Bounce and Rhyme activity and the customers who take part. Together they came up with the idea to ask a Mum looking to add to her CV while on maternity leave to volunteer to cover if the library is short on staff. A mum has volunteered and the staff continue to use the tool and would like to use other tools. Just blue-tacking the Building Success tool up in the staff room with one example has encouraged the rest of the team to use the Building Success tool informally as they pass through the staff room for communicating building matters like door-codes for the building. This has been particularly helpful for volunteers and new staff and the Area Manager has taken the tool to other libraries to inspire them to use it too.